Nodal aberration theory (NAT) describes the aberration properties of optical systems without symmetry. NAT was fully described mathematically and investigated through real-ray tracing software, but an experimental investigation is yet to be realized. 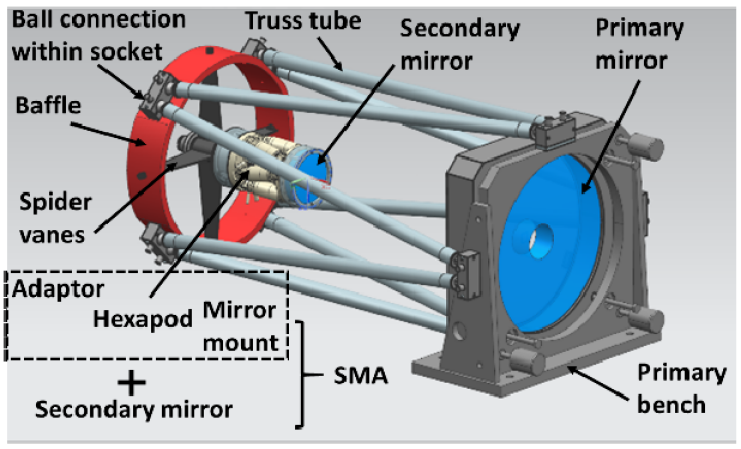 In this study, a two-mirror Ritchey-Chrétien telescope was designed and built, including testing of the mirrors in null configurations, for experimental investigation of NAT. 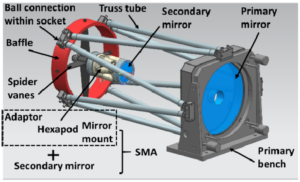 A feature of this custom telescope is a high-precision hexapod that controls the secondary mirror of the telescope to purposely introduce system misalignments and quantify the introduced aberrations interferometrically. A method was developed to capture interferograms for multiple points across the field of view without moving the interferometer. A simulation result of Fringe Zernike coma was generated and analyzed to provide a direct comparison with the experimental results. 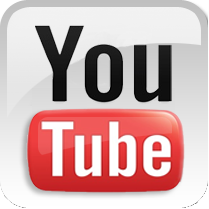 A statistical analysis of the measurements was conducted to assess residual differences between simulations and experimental results. The interferograms were consistent with the simulations, thus experimentally validating NAT for third-order coma.